Businesses of all scopes are using virtualization to their advantage, yet no company is completely downtime-proof. Interruptions in your business operations can result in a loss of revenue and affect business reputation. From this perspective, Hyper-V failover clustering can be leveraged by businesses with little to no tolerance of downtimes. Clustering technologies are escalating in their importance and becoming widely used thanks to the many advantages they offer. Clusters can help increase computing power, ensure high availability and effective load balancing in addition to enhancing fault tolerance capabilities. A failover cluster is created by means of inter-connecting multiple servers with shared storage over the network managed by special software. If one server in a cluster fails, its VMs can be reloaded on another available server which is a member of the cluster. This provides for high VM availability and the shortest downtime possible in cases of server failure. 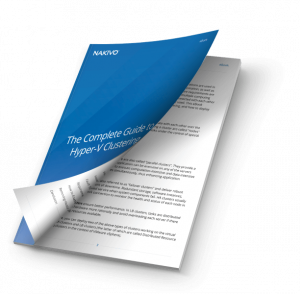 Download our eBook “The Complete Guide to Hyper-V Clustering” to get an in-depth understanding of clustering technologies, Hyper-V failover clusters, and how to deploy a Hyper-V failover cluster in your own environment.